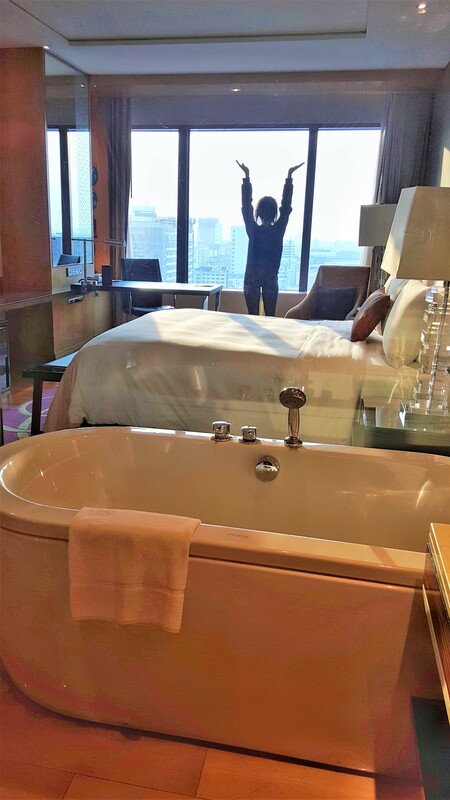 Our stay at the Renaissance Bangkok Ratchaprasong Hotel was spectacular. The only thing that made it better was that we paid nothing to stay here. Being a category 5 Marriott property which also happens to be a five-star hotel, that certainly makes for a great award or free night certificate redemption. In a city as warm and humid as Bangkok, a nice relaxing pool cannot not be overlooked. 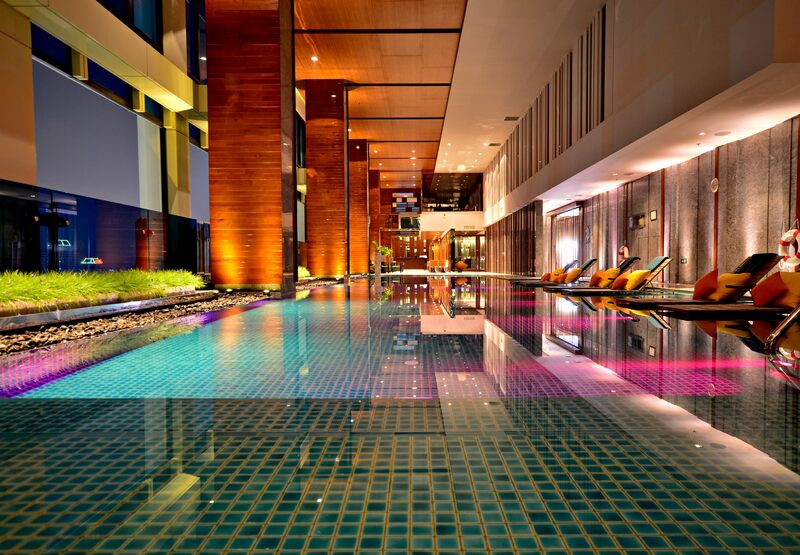 The indoor – multi color pool at the Renaissance Bangkok Ratchaprasong Hotel is a real eye-catcher. Stunning pool out-of-the-way, let’s look at the entrance to the lobby. The pickup and dropoff area of the hotel is a few hundred feet off the main street. It is also access-controlled by a number of security guard stations – 24/7. 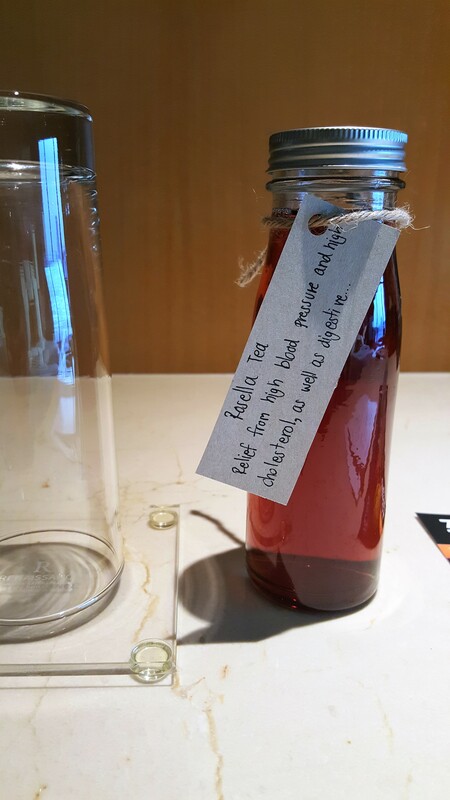 Before we made it to the check in counter we were greeted with cold glasses of local rosella tea. The lobby was very open with many places to lounge and wait for your taxi or simply cool-off. Our check-in agent was extremely helpful and even came around and took our bags right off our shoulders. In less than 60 seconds he guided us to the elevator and was taking us up to the 21st floor lounge. 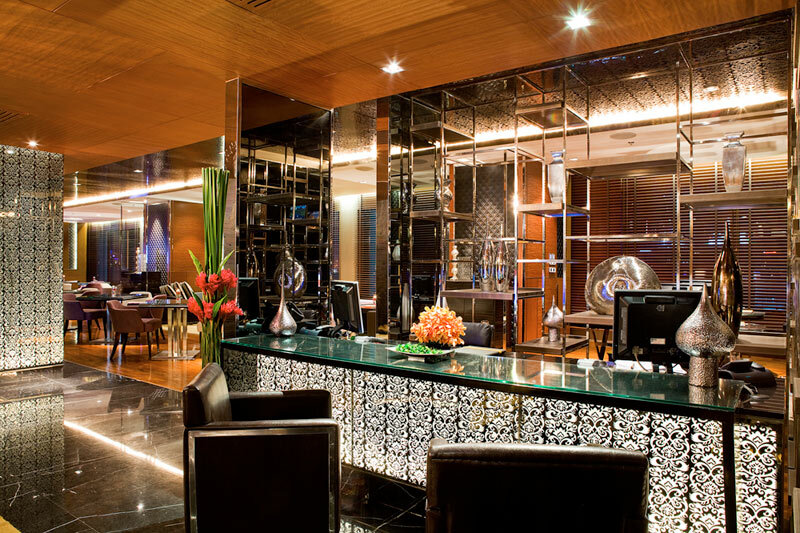 Being a Marriott Gold member, you are given lounge access at Renaissance hotels for the entire length of your stay. Rather than continue the check-in process on our feet in the lobby, he took us to the 21st floor lounge where we could sit and enjoy complimentary adult beverages. 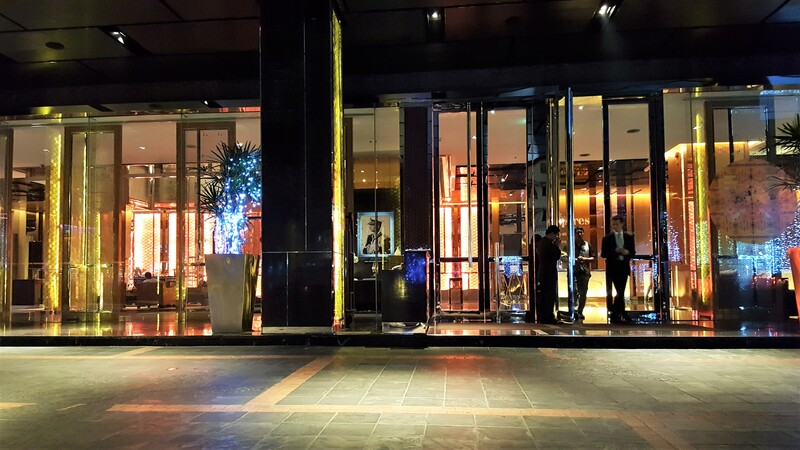 Tip: The American Express Platinum card grants you automatic SPG Gold status. Now that SPG and Marriott have begun their merger, your SPG Gold status translates into automatic Marriott Gold as well. After a few minutes and a tour of the lounge, we had our room keys and headed up one more floor. 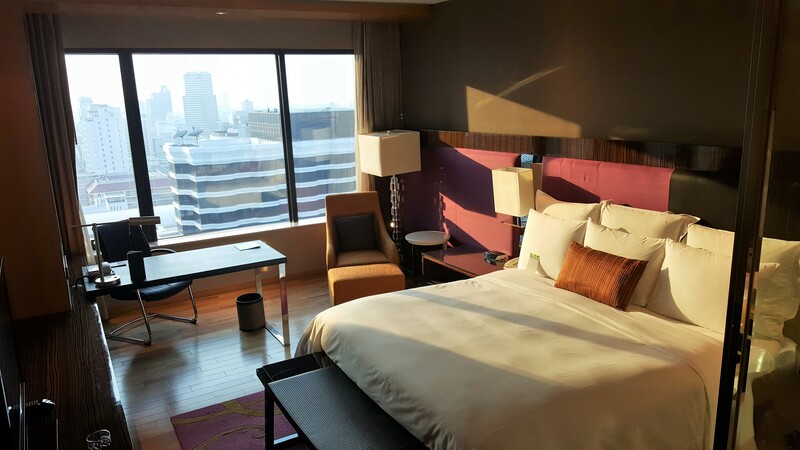 Another perk with Marriott Gold status is “high floor” room priority as well as room upgrades, as available. Our bags, which I’d briefly forgotten about, were already waiting in the room. 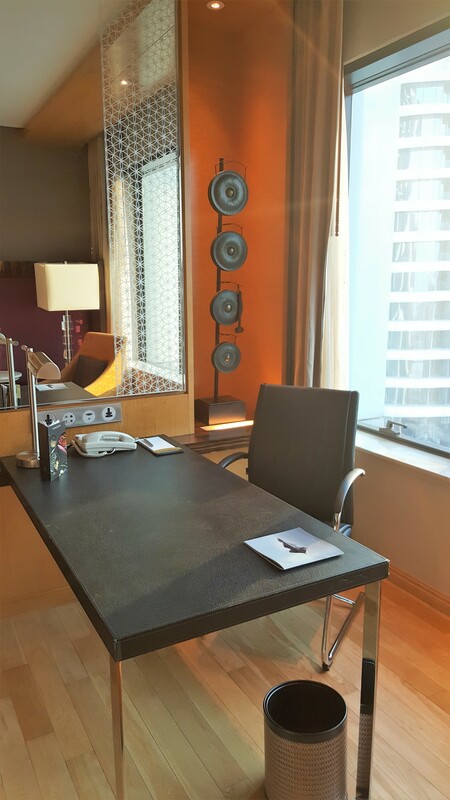 At twenty-two floors up, our executive club room was cleaned and prepped with absolute attention to detail. The view was great even with the usual Bangkok smog. 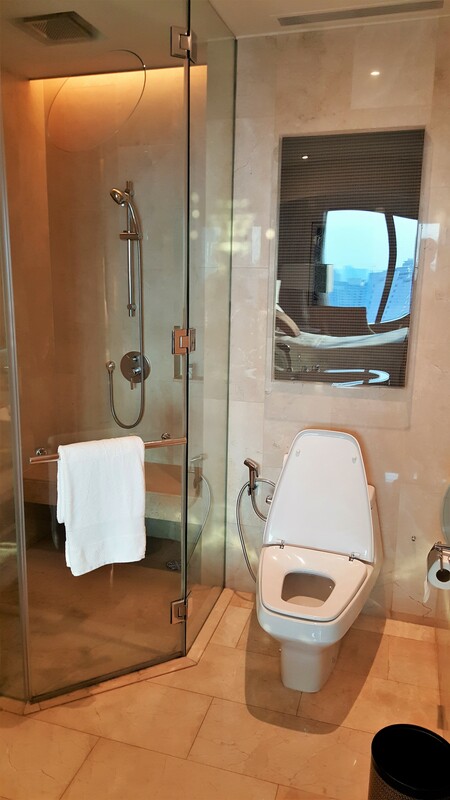 One thing to note, if you are traveling as a family you may want to ask for a room with a private bathroom area. If you are traveling solo or as a couple, you will likely enjoy the openness that the all-glass walls bring. 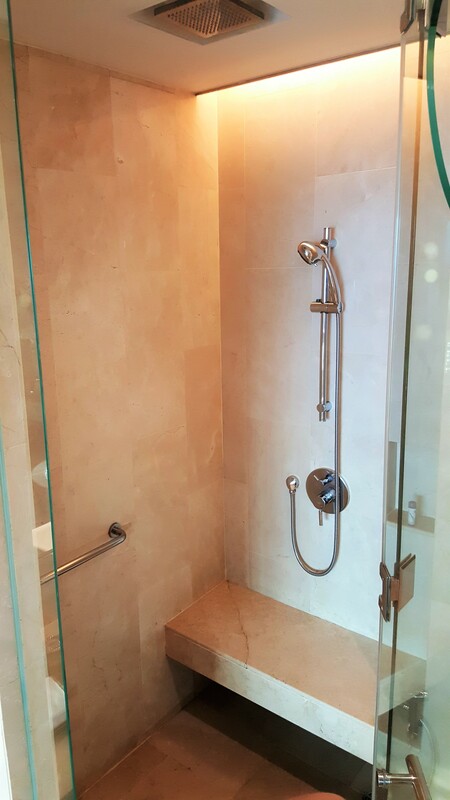 Speaking of the bathroom, it was very spacious with tile up to the ceiling. Our “Executive Club” room was just over 400 sq ft with the bathroom taking up roughly 1/3 of that. Cash prices for a non-suite room like this one will be in the $160-$200 range, per night. Nightly rates can vary greatly by season as well as the day of the week. If you put this same hotel in downtown San Francisco or on the Las Vegas Strip, you’d be looking at $500+ per night. The room was very comfortable with a nice blend of modern and contemporary design. I really appreciated the large windows and desk that made blogging on-the-go much more enjoyable. Other than a few USB ports, there were no US/North American electrical outlets. Make sure to bring a “Euro” adapter or two with you for larger electronics. Also, the night stands did not have easy access to outlets at all, seems like a simple upgrade they could make. 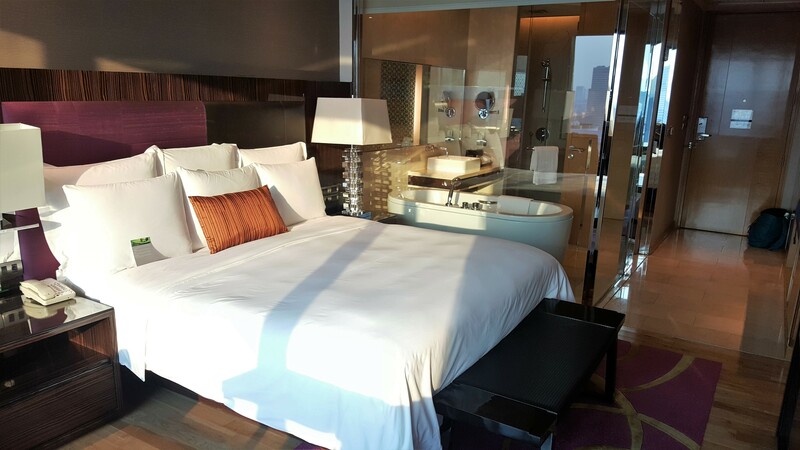 Our 22nd floor Club-room was just perfect and most importantly the bed and A/C were top-notch. We were just one floor above the executive lounge and it was definitely one you don’t want to skip. If you are paying cash, you can book an “executive club” room with access to the lounge for a bit more per night. For those with Marriott Gold status or higher, just book any room with cash or points, and lounge access is automatically included. 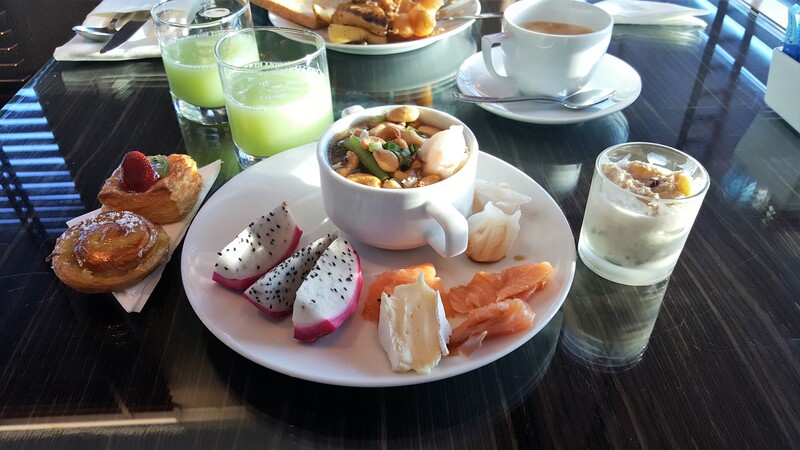 The lounge is open all day to – lounge – however they do serve complimentary breakfast, afternoon tea, and an evening “snack”. They stop short of calling it dinner but I think it could certainly pass for dinner if you are too tired to head downtown. Also, they don’t allow board shorts or flip-flops in the lounge, you must dress a bit over casual. It’s hard to say if my favorite part of breakfast was the smoked salmon or fresh guava juice, but either way it was delicious! And yes, that is dragon fruit, very common in Thailand, not so much in the lower-48. We used a free night certificate that is earned via your Chase Marriott credit card anniversary. You are able to book any Marriott property category 1-5 as long as they have award space. This is certainly one of the nicest category 5 Marriott properties I’ve stayed at. This same hotel in a North American metro city would be a category 7-8, easily. 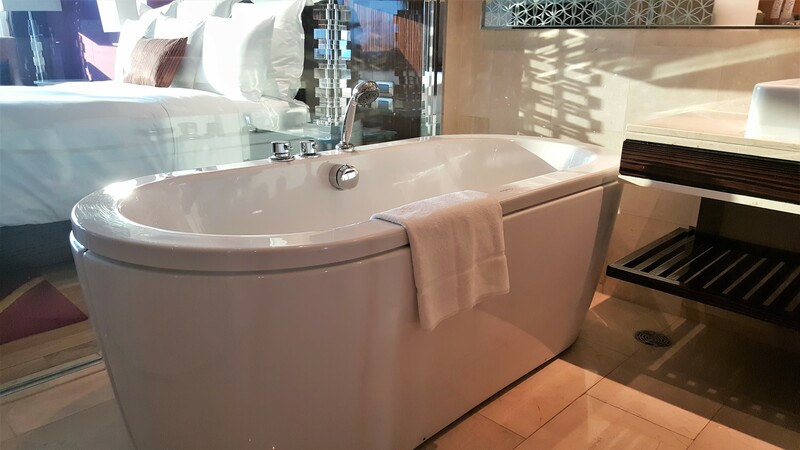 The current sign-up bonus for the SPG credit card is 35,000 points meaning you could get four free nights here with just one credit card bonus. If you average the cash price at $180 per night, you’re looking at a savings of over $700 by redeeming 33,332 SPG points on a four night stay. I would highly recommend The Renaissance Bangkok Ratchaprasong Hotel, in a heartbeat. I think I caught myself saying, “this is one of the nicest hotels we’ve stayed at” multiple times to Alyssa. 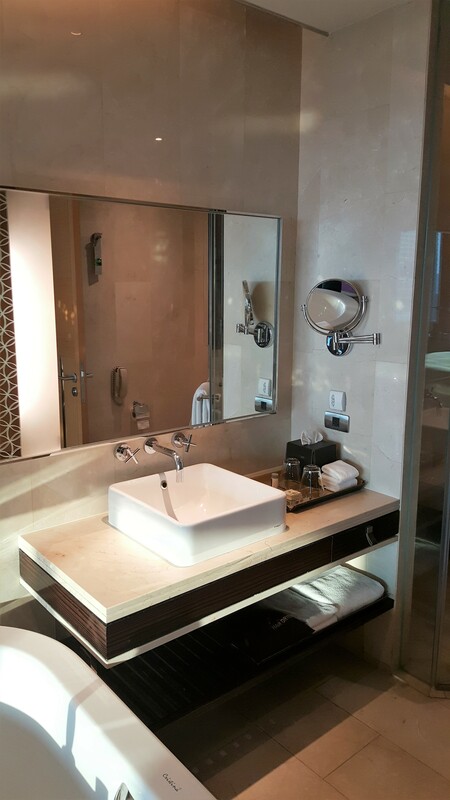 The friendliness and attention to detail of the hotel staff played a huge part in that overall impression. From the BKK airport, you can take a cab which will run you about $22-$28 depending on traffic. An UberX will cost in the $14-$18 range but you’ll have to wait for the car to arrive. If you want to take public transit it could not be easier. From the airport take the only train line into the city (it has A/C) until it makes its last stop at the Phaya Thai station. Walk about 4 minutes and connect on the green line (the only other connecting line) for Bearing. Once on the train for Bearing, you’ll go three stops looking for the station, Chit Lom. Exit at Chit Lom and take the stairs towards the south side of the street. There is a very large luxury shopping mall called Centara Grand on the north side of the street. That’s it, you are there. It will only cost you 70 BHT one-way, just $2 in total. Total travel time is under 40 minutes.